Blog Net Contents Big Enough? I have a wonderful Facebook feed and see an amazing number of soaps. All sorts of soaps … cold process, hot process, melt & pour, swirled, layered, piped, molded, embossed, stamped – you name it! I also see packaged soaps galore. While the traditional cigar band label is most common, soapmakers have also put together some different kinds of very creative and artistic packaging. But we need to have a little chat about the net contents. First off, I am very pleased that most of the recent packaging I’ve seen DOES have the net contents on it. And most of the time it is correctly stated in ounces and grams (for the US). This is an improvement over past years, when very few soapmakers put the net contents on their soap. I’m proud of y’all! On almost all of the packaging I’ve seen, it is way too small. Sometimes way, way, way too small. The PDP for a rectangular package (like a bar of soap) is the area of one flat side. Calculate the area by multiplying the height x length. A typical 3 – 5 ounce bar of soap usually measures somewhere around 2″ by 3″ so the area is 6 square inches. Nearly all bar soaps tend to fall in the middle bracket (5 – 25 square inches), so the height of the net contents should be 1/8″. Upper case letters only: Measure the height of an uppercase “L” in the font used. Upper and lower case letters: Measure the height of a lower case “o” in the font used. Print out the label full-size, and actually measure it with a ruler. Well, first off, it is WAY bigger than you or your label designer would like it to be. It stands out, takes up too much room and can easily ruin the beautiful layout you designed. Keep in mind also, that if you are using upper and lower case letters, then the LOWER CASE “o” is 1/8″ … so any upper case letters are probably around 1/4″ in height. What font size is that? Grab one of your packaged and labeled soaps and check the size of your net contents. 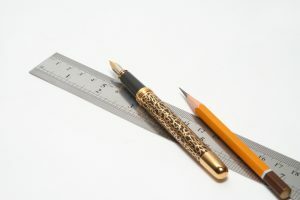 Get out a ruler and actually measure it. If it meets or beats the minimum required size and is correctly placed – good for you! If it’s too small, plan on updating your labels before you package your batch of soap. You can read more about the requirements for type size on a label (page 66) and the quantity of contents (pgs 75 – 92) in Soap and Cosmetic Labeling (available from Amazon). 2. ↑ See Soap and Cosmetic Labeling page 67 for a complete chart. Thanks so much for the reminder, Marie. I knew our net contents were too small but had resisted changing them. Your post was the impetus I needed and I’ve made corrections on all our products except for our soap boxes. Those will have to wait a bit while we work through the 10,000 we have on hand!